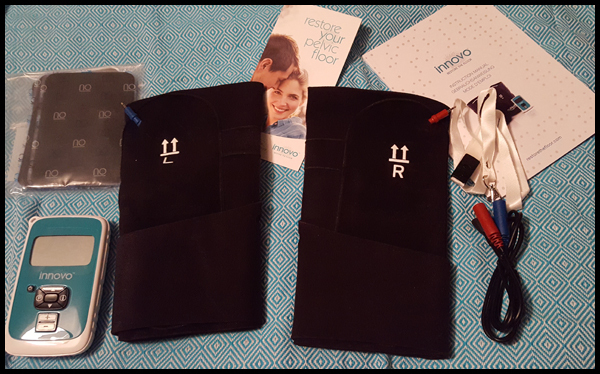 12 weeks ago I was given the opportunity to try out Innovo - a non-invasive way to restore your pelvic floor, and this product has improved my confidence, my wellbeing and my interaction with my son! I can not recommend it enough!! Before I tried the Innovo, I went to the doctors to discuss my stress incontinence. This is not something I wanted to do, or felt comfortable talking about especially as it was a doctor I've never met before and the first thing he did was tell me off for not completing my pelvic floor exercises!! His advice for dealing with stress incontinence was to start the pelvic floor exercises immediately. To have an examination now and then again in 2 months to see if there was any improvement with my pelvic wall. After 2 months I would then be put on a course of drugs to help with the strengthening of the wall along with the exercises and finally, there would be surgery to help toughen the wall. But, even after all of the above - there is no guarantee it would strengthen my pelvic wall. Needless to say, I came away from that appointment rather scared, deflated and demoralised. My son has a trampoline, I went to the bathroom before going on there with him, bounced twice with him then had to leave due to stress incontinence. That's heartbreaking, my son doesn't know or understand why I can't go on there with him. He just looks sad then asks for daddy. I can't sneeze without wetting myself! Coughing can be touch and go! Laughing I have no hope with, I'm going to wet myself. Running and exercise also brings on incontinence. It really makes me quite miserable and self-loathing and disappointed in myself for not doing my pelvic floor exercises. I can only now tell you all this because that was 12 weeks ago, the above was before I started using Innovo and before I found my confidence again. I strongly suggest watching the video on Innovo's website to see how to put the pads on the first time. Not because it's complicated but sometimes a video works better than written instructions. Allow yourself extra time the first time to get used to everything. 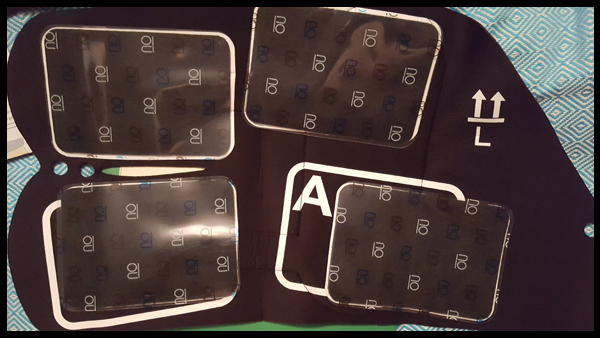 Once the pads are in place, you just rest for 30 minutes 5 times a week, yep, you get to rest! The recommended pulse rate is 70 - 75 but not straight away, I didn't get to that figure until week 4. I started at 33 intensity and slowly increased this over the 4 weeks. * In week 2 I sneezed and did not leak! * I also went out on a girls night out, but alas, alcohol and too many giggles were no matches for the Innovo. * In week 3 I went on the trampoline for 15 minutes before I needed to leave! * I ran up the stairs without even thinking about it! * Stress incontinence is no longer at the forefront of my mind. * I ran with my son! * In week 5 I blew up a balloon with no leakage! Fast forward 12 weeks and I'm a completely different person! I feel so much better, I have pride in myself again, I've lost 18lb, I go out on the trampoline with my son almost every day to have fun with him and to exercise. I run with him, I play with him and our days out are not such a pressure on me finding the toilets. This product, whilst not cheap, works! It will strengthen your pelvic floor, it will put stress incontinence to the back of your mind, and it will give you back your self-confidence. As I said at the start, I can't recommend this product enough. 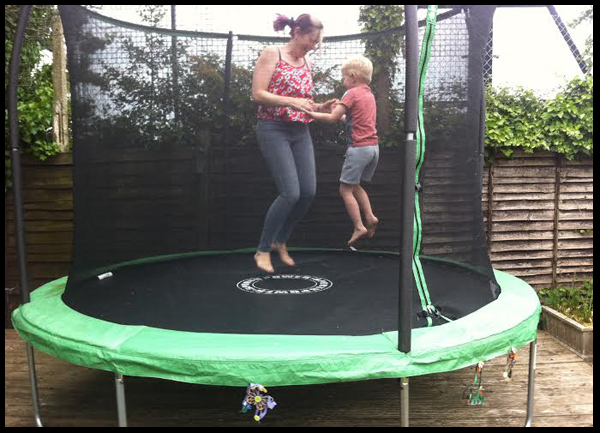 That's me, on one of many occasions that I know spend with my son on the trampoline. It doesn't get much better than this! I am a member of the Mumsnet Bloggers Panel, a group of parent bloggers who have volunteered to review products, services, events and brands for Mumsnet. I have not paid for the product. I have editorial control and retain full editorial integrity. Yes, it does work. It works on tightening the pelvic floor, you must stick to the routine thought, 12 weeks, 5 times a week and then just maintenance or complete pelvic floor exercises yourself at least twice a week after that.